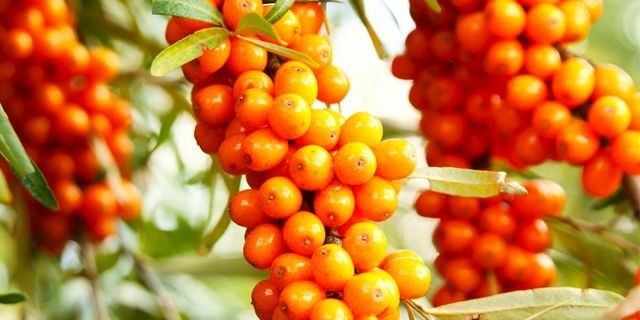 Have you eaten a sea buckthorn? These tiny, tart berries are nutrient-packed powerhouses that have an ideal balance of omega 3 and 6 fatty acids, and are also high in magnesium, calcium and zinc. So, they’re good for you – but what do they taste like? Sea buckthorn flavour is described as “tart and tropical” and their flavour lends itself well to salad dressings, fruit purees, baking, or as a fruit topping for yogurt or granola. They’re right at home in any recipe that you might use fresh or dried cranberries to impart a sweet tartness, and the frozen whole berries are also easy to drop into your morning smoothie. What the heck is a sea buckthorn? The plant is naturally occuring in numerous European and Asian countries, and is a relative of the buffaloberry. Historically, all parts of the plant— berries, leaves, and bark— have been used for their nutritional benefit. It has only been introduced and produced in Canada over the last 20 or so years. Recipe developed by Sarah Galvin, B.S.H.Ec. Whisk egg and cream together. Mix flour, sugar, salt and baking powder. Add cold butter and cut into dry mix until it looks pebbly. Add the berries and chocolate, and toss to coat with flour. Pour the egg mix into the dry ingredients and stir with a form until dough forms. Gently knead with your hands. Turn out onto a floured work sufrace and divide in half. Pat each half into a rough circle about one inch thick. Slice the circles into six wedges and place on the baking sheet. Bake 18-22 minutes or unti golden; cool 10 minutes before serving. For more information about sea buckthorn, visit the nvigorate site.